Posh match-winner Jon Taylor challenges Romain Vincelot of Orient for possession. Photo: Joe Dent/theposh.com. Yesterday’s (March 7) match-winner Jon Taylor insists good football will soon be accompanying good results for Peterborough United. Taylor’s goal - a cross that appeared to caught up in the wind - in the 1-0 victory over Leyton Orient at the ABAX Stadium made it three wins in a row for Posh under caretaker-manager Dave Robertson. 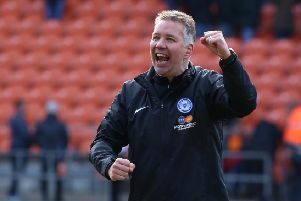 It was a scrappy match on a poor playing surface, but the win lifted Posh up to eighth in the League One table. They are level on points with sixth-placed Doncaster - the team occupying the final play-off place - who they meet at the Keepmoat Stadium next Saturday (March 14). It was Taylor’s third goal for Posh in an injury-interrupted campaign and he insisted, not entirely convincingly, that he meant to lob the Orient ‘keeper from a wide position. The winger was substituted 20 minutes from time for reasons of fatigue rather than a recurrence of his knee problem. “I’ve been talking to Ricardo Santos this week about shooting from that sort of position as the goalkeeper never expects it,” Taylor claimed. “I scored at fluke at Gillingham earlier in the season, but I meant this one. “Anyway it doesn’t really matter because the three points was the most important thing and it was another incredible effort from the lads, particularly the back four and the central midfielders. “We’re working so hard for each other, both in training and in matches. We’re putting teams under pressure when they have possession and we’ve become very hard to play against. “It was torture having to watch the final 20 minutes and not being able to help. There’s nothing worse that not being able to help your team-mates when they are defending for their lives, but we came through it to claim another great result. “It wasn’t the prettiest of games, but I am convinced attractive football will soon return. The confidence is coming back. “The defenders are doing their jobs and I suppose I did mine today by getting a good cross in and scoring, but we can play better football and we will. Mind you we used to play good football and lose so finding the right balance is the key. We are happy to grind out results if we have to and if we do get to the play-offs that’s the sort of football that you have to play to win them. “We’re enjoying our football again though which is important. The new manager has an infectious personality and it’s rubbing off on the rest of us. “His team-talks before and after games are very impressive. He gets us going and it’s no fluke that he has won his first three matches. We finish a game now and we can’t wait for the next one to arrive. The next one happens to be a six-pointer so we will make sure we are ready for that. Posh are in the middle of a tough run of matches. After Doncaster they travel to second-placed Preston on Tuesday, March 17 and then host play-off chasing Chesterfield (March 21).